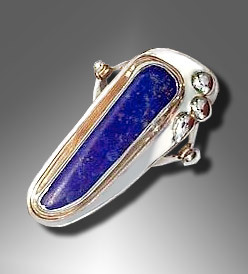 Lapis ring with hand cut lapis lazuli stone with gold pyrite inclusions. The stone is set in a fine silver bezel and outlined with 14k gold. Several solid sterling silver balls accent the base and sides of the shank. Available in full and half sizes 6 through 9 1/2.